Predicted to be No. 1 in the ‘Top 10 Spirits Trends for 2014’, the Irish whiskey industry is booming worldwide, and we’re not ignoring this rising trend toward the darker side of the spirit spectrum. Jameson is triple distilled, making it super smooth and versatile, perfect for mixing with your usual suspects like dry ginger ale, and soda with a wedge of lime, but we’re happily taking advantage of the cool new offering at one of our favourite local haunts. Ponsonby’s Golden Dawn is the first bar in New Zealand to be given the ‘Jameson Juicer’ so bartenders can mix things up with some fresh fruit and vege combinations, encouraging people to try something new with Jameson. Sitting at the crossroads of Ponsonby and Richmond Road in Auckland with a discreet entrance that is easily missed, Golden Dawn originally opened as a pop-up bar three years ago that never popped back down. 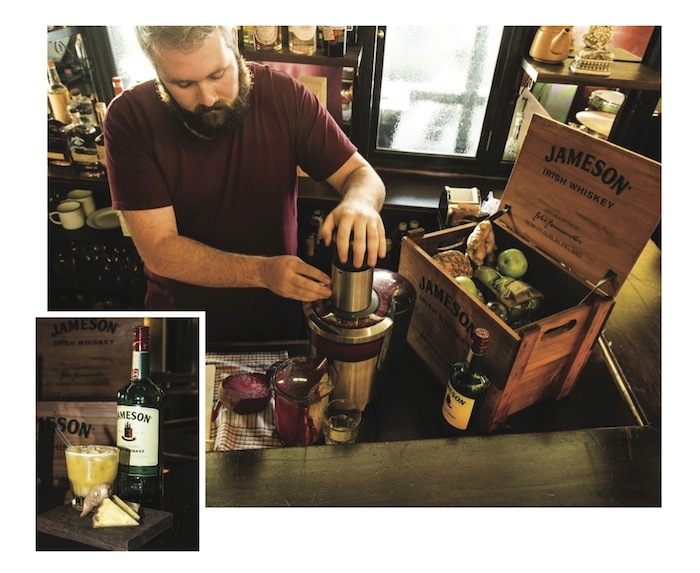 The bartenders are all about making great drinks and encouraging customers to step out of their comfort zone, making it the perfect venue for the Jameson Juicer project. Our pick is the Jameson and Fresh Granny Smith apple with its crisp and tart flavour. We love the zing of the Jameson, pineapple and ginger mix and were surprisingly won over by the quirky earthiness of the Jameson, beetroot, pear, and chilli combination. Over the next two months they’ll be juicing up a storm and you’ll be able to try all these refreshing, delicious and unexpectedly awesome juice combos and more at selected bars across New Zealand including Britomart Country Club in Auckland from August. Click here to get more information on the Jameson Irish Whiskey website and here to get the latest Jameson updates on Facebook.